Today’s reflection is also something that I learned from the devotional book I told you about last reflection “Redefined.” I am LOVING it so far and I am almost done. I may just re-read it after! Anyway. Something that really spoke to me was the story of the Israelites after they were freed from Egypt. However, after some time they start to complain. They’re tired. They’re hungry. They’re thirsty. They want to go back to Egypt. Liiiike where they were SLAVES. They want to go back to THAT. 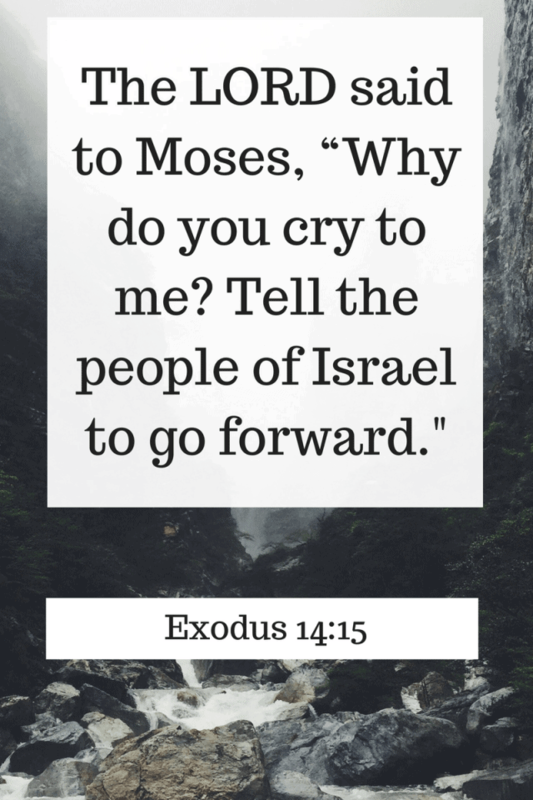 He doesn’t tell Moses to tell the Israelites that everything will be okay or that He has it all planned out or anything like that. Just to GO FORWARD. And it got me to thinking how many times in our lives do we want to run back to our old life even if we know it’s not right? It’s comfortable. We know it. So, we don’t want to go through the scary/uncomfortableness of changing and trusting God. We want Him to show us when it’s going to get easier and what His plan is. At least I feel this way this sometime. But, he doesn’t call us to ask for answers. He just wants us to trust him and keep MOVING FORWARD in that trust. You know what? When the Israelites kept moving forward, just around the corner was Elim. A land of flowing water! Our Elim could be just around the corner if we just keep moving forward! Thank you for your Sunday emails. I really enjoy reading them. All the best!!! Such a great post. I love reading these. That makes me so happy! Thank you Alicia!